Union Square has gone from a sand dune that war hero John W. Geary gave to the city of San Francisco to one of the world's ultimate upscale shopping wonderlands. Geary was, one author observes, "an excellent target for enemy fire: a huge man for that era, he stood six feet six inches tall, [and carried] 260 pounds." He was shot five times in a single battle of the Mexican-American war; a cannon ball nearly took off his head during the civil war. He still managed to become the first mayor of the city, however, and then governor of Kansas and then Pennsylvania. The sand dune became Union Square because it was one of the few open spaces where San Franciscans could celebrate everytime Union troops trounced the enemy in the Civil War. When Abraham Lincoln was assassinated, 14,000 grieving citizens flocked to Union Square to commemorate the man. A hundred years later, Hitchcock filled Union Square up with birds and shot the opening scene of his classic suspense/thriller The Birds (1963). He also used the Square for bits of Vertigo (1958). Other things have been filmed there, and the Square remains an important civic landmark, but what's most striking now is the A-List stores that lay siege to the once-upon-a-time sand pile. Just scratching the surface, boutiques include Louis Vuitton, Gucci, Chanel, Bottega Veneta, Burberry, Prada, Armani, and department stores include Bloomingdale's, Barneys New York, Nordstrom, Saks Fifth Avenue, and Neiman Marcus. There's a Gump's. And on and on and on and on. Union Square is a 2.6-acre (1.1 ha) public plaza bordered by Geary, Powell, Post and Stockton Streets in downtown San Francisco, California. "Union Square" also refers to the central shopping, hotel, and theater district that surrounds the plaza for several blocks. The area got its name because it was once used for Thomas Starr King rallies and support for the Union Army during the American Civil War, earning its designation as a California Historical Landmark. Today, this one-block plaza and surrounding area is one of the largest collections of department stores, upscale boutiques, gift shops, art galleries, and beauty salons in the United States, making Union Square a major tourist destination and a vital, cosmopolitan gathering place in downtown San Francisco. Grand hotels and small inns, as well as repertory, off-Broadway, and single-act theaters also contribute to the area's dynamic, 24-hour character. The Dewey Monument is located at the center of Union Square. It is a statue of Nike, the ancient Greek Goddess of Victory. 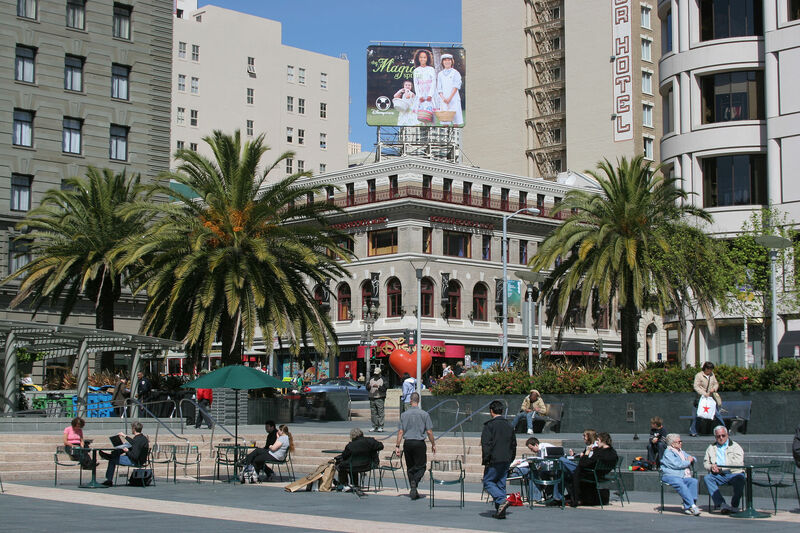 Check out the full Wikipedia article about Union Square, San Francisco.